In collaboration with Toxic Sites, Public Lab will be at the Photoville Exhibit in Brooklyn Bridge Park on Saturday 19 September from 12 to 4 pm. 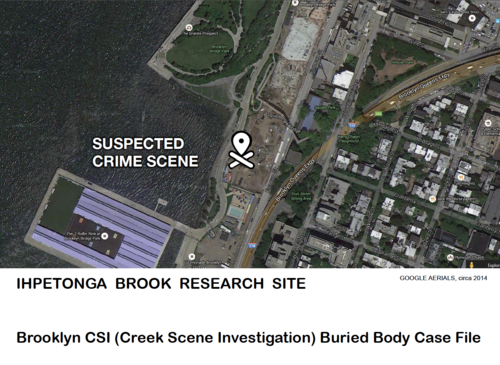 Eymund Diegel and other Public Lab researchers from the Gowanus Canal Superfund site will be demonstrating Brooklyn CSI (Creek Scene Investigation) techniques perfected with the Gowanus Canal Conservancy to map buried streams. Mapping buried streams helps us to better understand our neighborhood history, pollution dispersal patterns and water quality improvement opportunities. The existence of the stream is based on the 1781 British Military Headquarters Map, which shows a military fort built on top of a strategic water supply at what is now Love Lane and Henry Street. As result of streams being diverted to sewers, combined sewer overflows (CSOs) discharge polluted water into the river during heavy rain events. Brooklyn CSI will be investigating whether there is any relationship between Ihpetonga Brook and the RH 12 and RH 10 combined sewer overflows discharging over 10 million gallons per year of sewage next to the Park. 1828 painting by William Guy Wall, showing a view of New York Harbor and Governors Island from Brooklyn Heights, from the Metropolitan Museum of Art. The bare earth in the painting is speculated to be the ruins of the old fort ramparts, located at Brooklyn Height's highest point near what is today Love Lane and the Appellate Court building. In the foreground is the water supply from the spring, and erosion patterns of the stream bed. 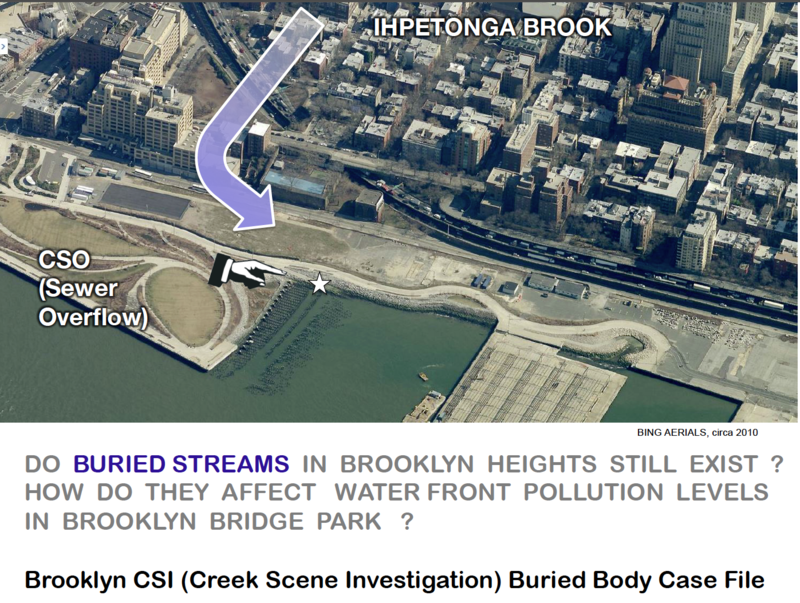 Brooklyn CSI is interested to see if high resolution citizen generated aerial photography can detect subtle patterns of vegetation change and plant health that may give clues to ground water hydrology. 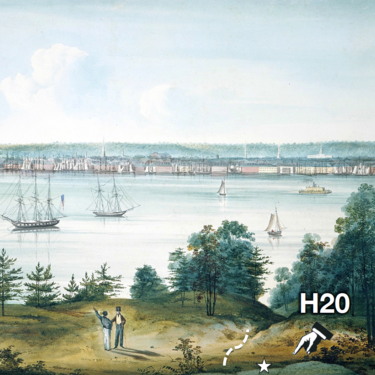 By understanding exactly where the water is going, we may discover opportunities for getting clean ground water springs out the City's sewer system and into more sustainable uses, such as Street Creeks. 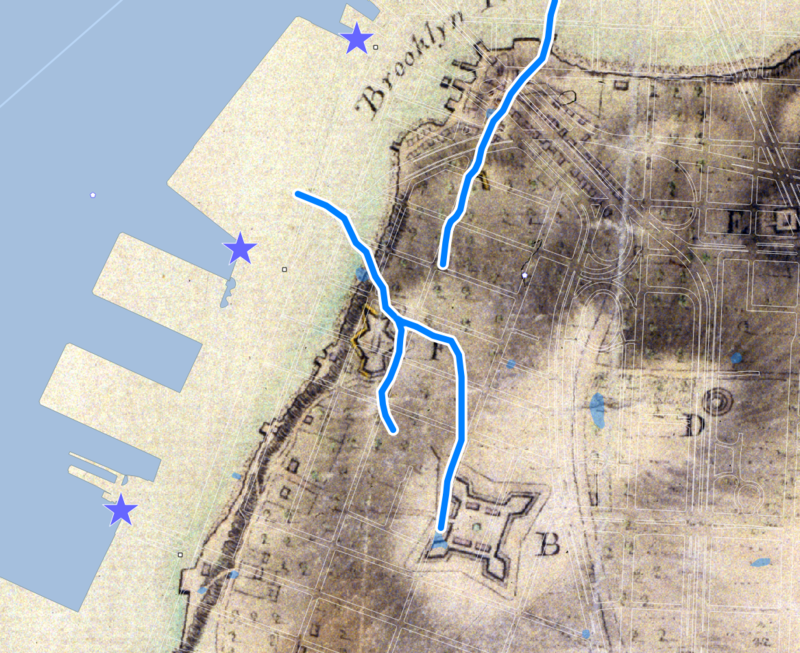 1781, A Map of the Environs of Brooklyn showing Brooklyn Heights Fortifications by George S Sproule. 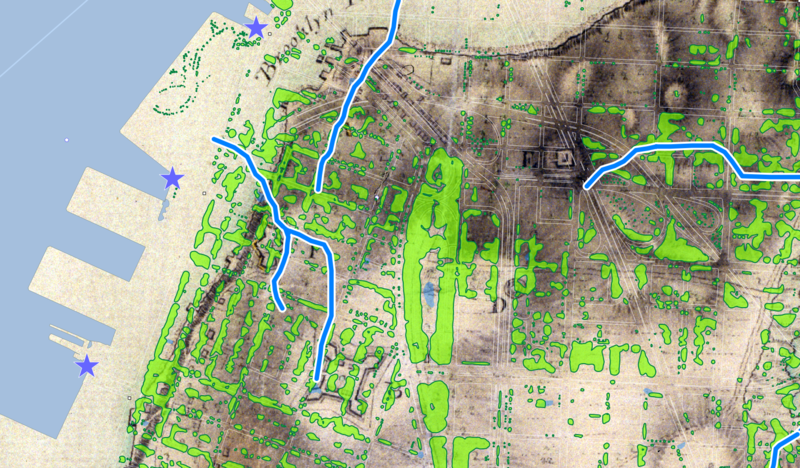 The map is overlaid with the current street grid, shoreline and 2010 approximate tree canopy cover. Citizen generated aerial infrared photography can indicate which trees may be healthiest because they are growing on or near historic stream beds. 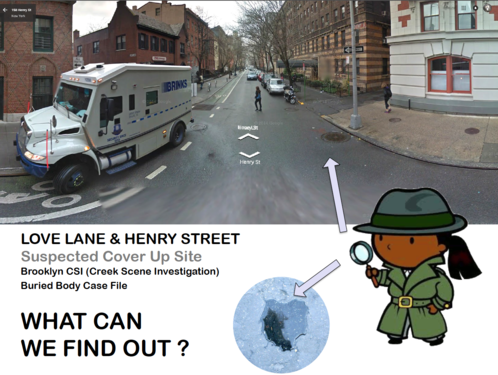 Plus the heavy security in the Google Street view hints at government cover up of a buried body, and I'm all over that..
Join the research fun !